So we have some Alpha Youth Events coming up! One in Dublin, one in the Midlands and one in Cork. If you yourself or someone you know are a young person, have any youth groups, involved in schools or know of other youth workers who would be interested in attending this event please join us and share with others. It is a FREE and will include food, games, fun, an short talk, sumo suits and thanks to Youth for Christ a soccer cage. 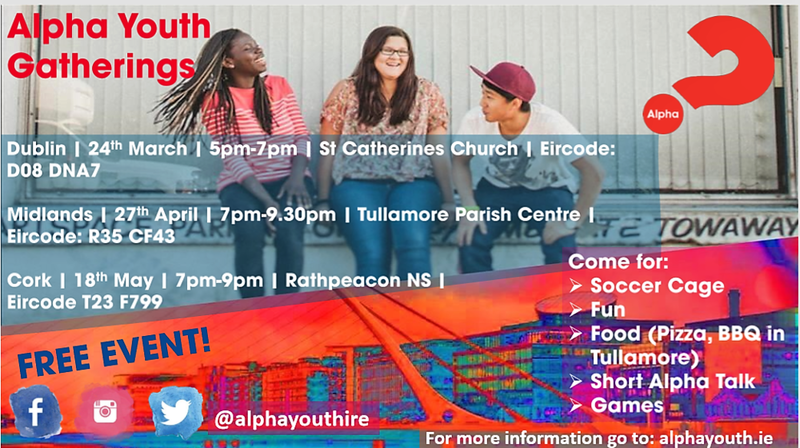 The event is to link young people who have been involved with Alphas to have fun, meet each other and connect with youth groups in Dublin. See you guys there and can't wait to have SO MUCH FUN!! !